The Firefly Music Festival just announced its Camping Schedule for 2017. These up-and-coming acts are scheduled to playing in the North and South Hub areas, just outside the festival grounds, starting Wednesday through Sunday. Be sure to check out these bands as you are getting ready and heading into the festival each day as they are headed for the big stage someday. Philadelphia's own The Lawsuits, Cold Roses, Louie Louie, and Vita and the Woolf are playing either Saturday or Sunday. Also, for the first time ever Firefly has added a "Northeast Rising Showcase" stage to the Campgrounds. This stage will be in the South Hub on Saturday and the North Hub on Sunday. The lineup each day is comprised completely of Philadelphia area musicians. They include Shizz Lo, Armani Lee, Anna Shoemaker, Luke O'Brien, OddKidOut, Chill Moody, Hardwork Movement, Astro 8000, Ill Fated Natives, Joie Kathos, Mir Fontane, Miles Chancellor, and QuiteHype. The lineup is the same for each day. Our friends over at RECPhilly had a hand in helping put together this Philly local stage at Firefly. The Northeast Rising Showcase will run from 10am-6:30pm each day. 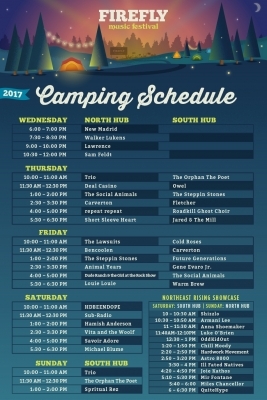 Check out the schedule below or at https://fireflyfestival.com/lineup/2017-daily-lineup/ for exact times.